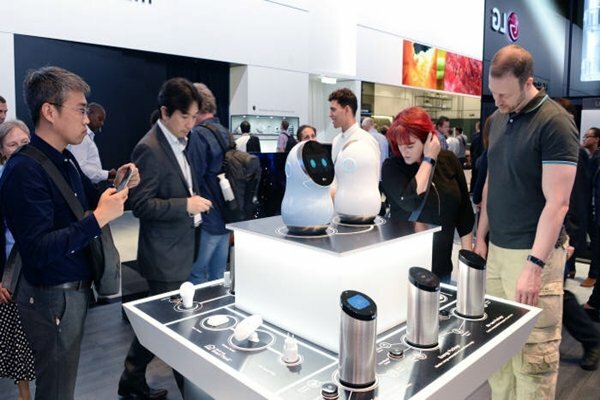 Artificial intelligence (AI)-based ‘Smart Home’ has emerged as a new source of profit for global home appliance industries as they are going all in on connected services that are implemented by combining AI, IoT (Internet of Things), and variety of sensors. Partnerships between home appliance industries and businesses such as Google, Amazon, and Apple that possess AI technologies are also actively taking place. At ‘IFA 2017’, which began in Berlin, Germany on the 1st (German time), global home appliance manufacturers such as Samsung Electronics, LG Electronics, SONY, Panasonic, Miele, Siemens, Hisense, and Changhong displayed Smart Home products as the main products of their exhibitions. Previously only few leading businesses such as Samsung Electronics and LG Electronics introduced Smart Home technologies and more than half of businesses that participated in CES 2017, which was held early this year, demonstrated Smart Home technologies. However at IFA 2017, practically every home appliance manufacturers from all over the world introduced their Smart Home technologies. While there were many businesses that introduced Smart devices that are applied with AI technologies before, businesses that are participating in IFA 2017 are introducing expansion of Smart Life by connecting variety of devices with each other. Although methods that are used by businesses are somewhat different from each other, most of them are based on convergence between voice recognition AI, IoT, sensor, and Cloud technologies. Most of them especially applied voice recognition, which is a convenient way of inputting commands, as a basic technology since Smart Home is a technology for implementing more convenient life. Home appliance manufacturers selected variety of voice recognition technologies such as Amazon’s ‘Alexa’, Google’s ‘Google Assistant’, Microsoft’s ‘Cortana’, and Apple’s ‘Siri’. What drew focus was the fact that businesses that have more advanced Smart Home businesses joined hands with at least two voice recognition AI services. However for now, most of them are using a service from either Amazon or Google as if to say that the main characters of this year’s IFA are Amazon and Google. On the other hand, Samsung Electronics used its own AI technology called ‘Bixby’. Home appliance manufacturers also put out their strategies to build up their Smart Home businesses. Samsung Electronics suggested strategies that will establish a Smart Home ecosystem centered on users. Because Samsung Electronics has all home appliances and IT products that are used in daily lives and its own AI technology called ‘Bixby’, it believes that it is at an advantage in implementing a Smart Home environment. Not only does Samsung Electronics have innovative products from each business sector but its strength is its IoT capabilities that cover every fields such as IoT-related chips, sensors, OS (Operating System), Cloud, AI, voice recognition, wireless telecommunication, and security solution. LG Electronics is going to double amount of annual investment by 2020 in order to drastically enhance its Smart Home businesses based on AI home appliances, IoT, and robots. It is going to continuously expand lineup of its AI home appliances and it also put out its plan to increase number of its R&D personnel for Smart Home technologies by 50% within three years.